Author(s): Taoufik Ksiksi, Department of Biology, United Arab Emirates University, PO Box 15551, Al-Ain, United Arab Emirates., United Arab Emirates	Abdul Rasheed Palakkott, Shaijal B.T. Ppoyil. Background: Tribulus terrestris, unlike Tribulus macropterus and Tribulus arabicus, is a well-studied plant species and well known for its medicinal properties. It has been used as a medicine to treat sexual dysfunction and to relieve cardiac pain. It also has other properties such as antihypertensive, anti-microbial, anticancer and antihelmintic. Unfortunately, other Tribulus species such as T. macropterus and T. arabicus (common in the UAE), were not thoroughly investigated for such medicinal properties. Methods: In this trial, Tribulus terrestris (TT), Tribulus macropterus (TM) and Tribulus arabicus (TA) were tested for their antixodiant properties using DPPH, ABTS, FRAP and β-Carotene assays. Results: TM and TA showed similar or slightly greater antioxidant properties than TT. Similar DPPH scavenging activities (presented as inhibition percent) were observed for both TM (42.7%) and TA (43.8%), and slightly higher than TT (39.9%) at the maximum concentrations (i.e., 1000 ug/ml). For β-Carotene, TT showed absorbance of 0.28 (control) and 0.35 (at 1000 ug/ml). TM and TA had averages of 0.38 and 0.49 vs 0.190 and 0.23 (control and at 1000 ug/ml, respectively) at 470 nm. 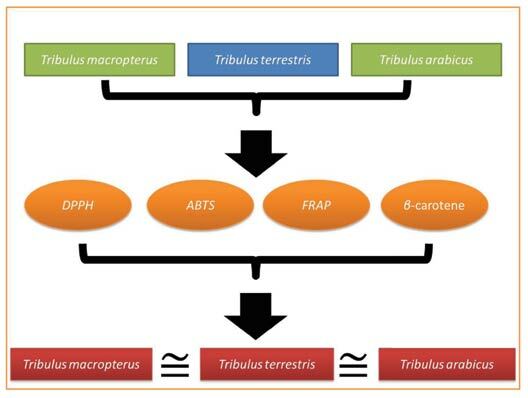 Conclusion: The results reported here showed similar antioxidant potentials of T. macropterus and T. arabicus when compared to T. terrestris, which place these two Tribulus species at similar levels of antioxidant and medicinal properties as T. terrestris. A subsequent investigation on the potentials of T. macropterus and T. arabicus against sexual dysfunctions in rats is planned. The long-term aim would be to treat sexual dysfunctions in humans using T. macropterus and T. arabicus as an alternative to T. terrestris. Keywords: Plant extracts, sexual dysfunctions, Tribulus, UAE. Affiliation:Department of Biology, United Arab Emirates University, PO Box 15551, Al-Ain, United Arab Emirates. Keywords:Plant extracts, sexual dysfunctions, Tribulus, UAE. Abstract:Background: Tribulus terrestris, unlike Tribulus macropterus and Tribulus arabicus, is a well-studied plant species and well known for its medicinal properties. It has been used as a medicine to treat sexual dysfunction and to relieve cardiac pain. It also has other properties such as antihypertensive, anti-microbial, anticancer and antihelmintic. Unfortunately, other Tribulus species such as T. macropterus and T. arabicus (common in the UAE), were not thoroughly investigated for such medicinal properties.